There are very few times I find words can’t adequately explain a performance. Togetherish is a fascinating, highly entertaining dance playing at the Factory Theatre Mainspace as part of the 2015 Toronto SummerWorks Festival that genuinely defies description. Sitting in the theatre with a small audience, I wasn’t quite sure what to expect when two dancers began tying up the black stage curtains, revealing everything: black boxes, costume racks, speakers, all the exits. 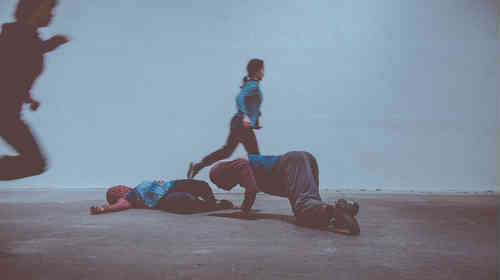 According to the program, Togetherish was originally developed as a quartet in a warehouse space, then became a duet for a gallery installation, and has been adapted for the theatre in its SummerWorks iteration. I wish I could have seen every version of this dance. The choreography and direction by Meg Foley of Moving Parts felt like a natural extension of the theatre, fully removing the fourth wall in a way that I thought was brilliant. There’s no attempt to poke and prod at the relationship between the performance space and the audience. Instead, I felt like someone invited into a rehearsal where the performers were both serious about their work but also happy for the company. Jungeun Kim and Drew Kaiser are amazing. Between their chemistry, energy, and stage presence I was swept away. When the show ended, I was surprised because it felt like no time at all. What Togetherish really capitalizes on is the fun in live performance. Kim and Kaiser occasionally put on and turn off music, sometimes they request light cues from their technician, and at other moments they mumble lines to themselves and the audience. It’s both hilarious and striking because it really makes you look at the dance as part of the moment. I don’t think there’s a better way to describe it than an instant where everything comes together. I doubt Togetherish will be everyone’s cup of tea but in my opinion, it’s a piece that needs to be seen.